From Lauren: This recipe is created by Jean Choi, who regularly contributes grain-free recipes. I’m so excited to share a recipe today that’s near and dear to my heart. 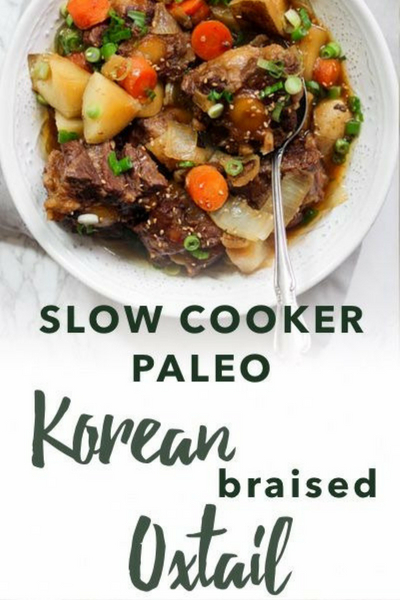 This Paleo Slow Cooker Braised Korean Oxtail, or Kkorijjim in Korean, is one of those dishes that I grew up eating at home, and it’s an example of the types of recipes that you’ll find in my Korean Paleo cookbook that’ll release in December 2018. Growing up in a Korean household, I’ve always had a deep love and appreciation for traditional Korean cooking and it’s one of the most comforting cuisines to me that always makes me think of my family and birthplace. 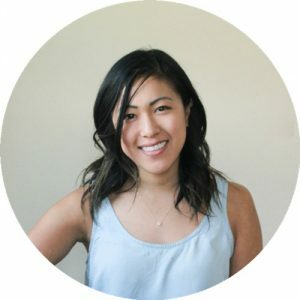 When I gave up gluten, soy, dairy, and most grains because of my food intolerances, I was so sad to learn that many ingredients in Korean food include soy, wheat, and processed sugars, especially in modern pre-made condiments and sauces used in restaurants. To still enjoy some of my favorite Korean dishes, I’ve been recreating them at home using allergen-friendly ingredients while keeping true to their authentic flavors. I hope you enjoy this delicious and flavorful Kkorijjim, that can easily be made in the slow cooker. The best way to eat it is to hold it with your hands to pick out all the meat and connective tissues attached to the bone (the BEST part, in my opinion). 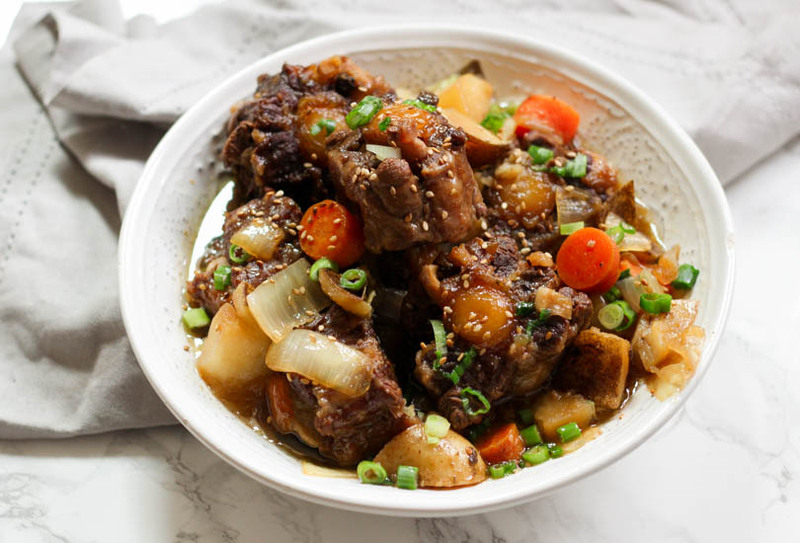 There’s something so comforting and nutritious about the way oxtail gels its braising liquid from the all beneficial collagen that it releases, and I think you’ll love this comforting dish. Oxtail – Oxtail is so flavorful and nutritious because it’s so rich in gelatin and essential amino acids. To get the maximum benefits, I recommend finding grass fed and pasture raised oxtail from your local farmer. Coconut aminos – Essential to Paleo Asian cooking, coconut aminos is the main ingredient of the braising liquid used in this recipe. It’s a great replacement for soy sauce but has a slightly lighter and sweeter taste, so take that into account if you decide to substitute with soy or tamari sauce. Honey – This dish traditionally has the most addicting sweet and salty flavor, but if you are avoiding sugar or on a low carb diet, you can omit the honey. Use a paper towel to pat the oxtail dry. Whisk together all ingredients for the braising liquid in a bowl and set aside. Heat coconut oil in a skillet over medium high heat. Sear the oxtail batches until the meat is browned on all sides. 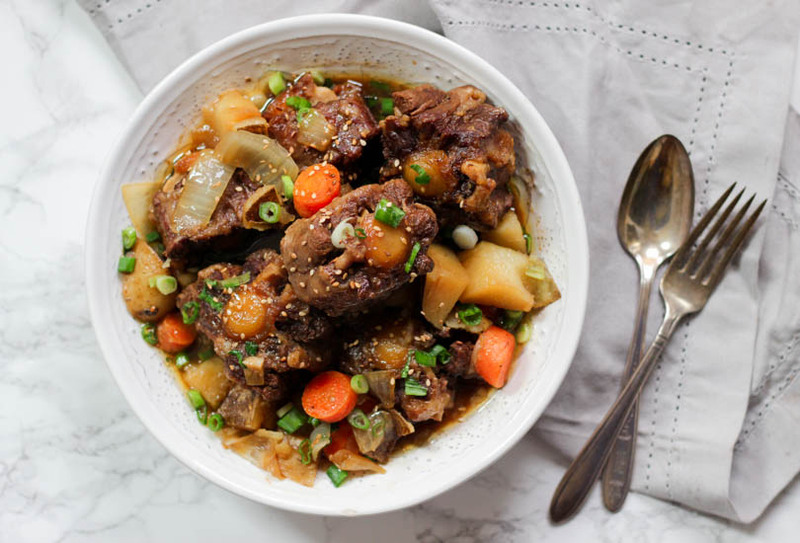 Place the oxtail, potatoes, carrots, and onion in the slow cooker. Evenly pour the sauce over everything, then stir together to coat. Cook on low for 8-9 hours or high for 4-5 hours. Sprinkle with green onions and toasted sesame seeds before serving.